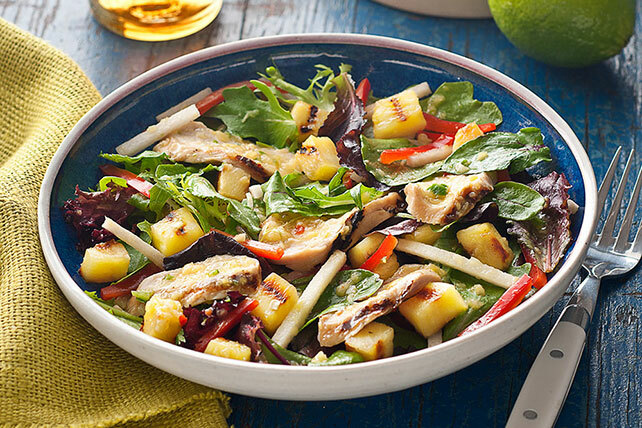 Served straight off the grill or chilled as a make-ahead salad, this tasty chicken and pineapple dish is a real crowd-pleaser. Grill chicken 5 to 7 min. on each side or until done (165°F). Meanwhile, grill pineapple slices and chile 8 to 10 min. or until tender, turning occasionally. Cut pineapple into 1/2-inch chunks. Blend dressing, 2/3 cup pineapple chunks and chile in blender until smooth. Cut chicken into strips. Combine chicken, dressing mixture, remaining pineapple chunks and all remaining ingredients except lime juice. Drizzle with lime juice. Grill chicken, pineapple and chile as directed; cut chicken into strips. Prepare dressing mixture. Layer chicken, remaining pineapple chunks, salad greens, red peppers and jicama in large bowl. Refrigerate up to 4 hours. Toss with dressing mixture and drizzle with lime juice just before serving. For extra flavor, brush chicken with additional 1/4 cup KRAFT Zesty Italian Dressing before grilling.